Remembering Revolution begins with an account of an incident in 1971 in which a group of young Naxalite rebels held the author’s family hostage in their South Kolkata home and stole an assortment of weapons belonging to her grandfather. This was some time before Srila Roy’s birth, but she vividly outlines the impact this incident would have on her own family’s collective memory. This extraordinary opening sets the tone for the rest of the book, which consists of a wonderfully engrossing depiction of the personal, political and cultural memory of the Maoist Naxalbari movement, whose often violent struggle against the state continues to profoundly shape the political landscape of the Indian subcontinent, especially in its original birthplace of West Bengal. While the book uses a multi-method approach to examine representations of the Naxalbari movement in film, fiction, scholarly literature and autobiographical writing, the bulk of Roy’s data is drawn from a series of interviews with women and men active in the movement during its late 1960s/early 1970s heyday. In so doing, there are a number of recurrent themes. These include, first, a critical consideration of how the often fraught and ambivalent memories of participation in revolutionary politics impact upon the ‘composure’ of former activists’ subjectivities in the present; second, a consideration of what Roy calls the ‘ethical ambivalence’ of armed political struggle, and the strategies former activists use to come to terms with this; and, third, a consideration of the interrelationships between different forms of violence—including sexual violence within the movement, state violence against the movement, political violence by the movement and the everyday violence enacted by social and cultural norms. Most significant, however, is the centrality afforded to gender dynamics and the formation of gendered subjectivities. In particular, Roy discusses the paradoxes and contradictions of how the movement was—on the one hand—a space conducive to transgressions of gender norms and enactments of particular kinds of gendered agency, and yet—on the other hand—was also a space replete with strong pressures to adhere to the conventions of (usually) middle-class femininity. 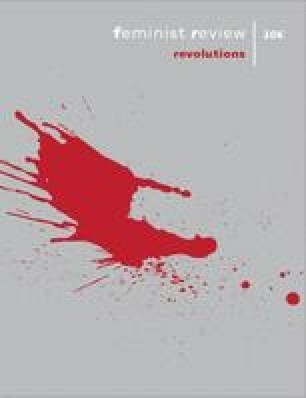 Indeed, perhaps the richest part of Remembering Revolution is its analysis of the memory of forms of sexual and normative violence within the movement, and the difficulties these present for women seeking to make sense of their activist past. Roy outlines how the movement’s emphasis on the state as the primary agent of violence, coupled with adherence to patriarchal norms and valorisation of unity and comradeship, served to marginalise discussions of sexual violence and thus to silence potential feminist critique of the movement’s gendered cultures. In the latter stages of the book, Roy’s analysis of her women interviewees’ difficulties in framing their experiences of gender inequality (and in several cases sexual violence) within the movement makes for uncomfortable yet fascinating reading, and provides a genuinely compelling account of the interplay between sexual and political violence. Although she concludes that the temptation to draw ethical distinctions between ‘emancipatory’ and oppressive forms of violence will likely prove unsustainable in practice, she nonetheless foregrounds ambiguity throughout, cautioning against the twin temptations of outright condemnation or romanticisation of revolutionary movements. While Roy frames her contribution as plugging a ‘gap’ in offering a specifically gendered analysis of the Naxalbari movement, Remembering Revolution goes far beyond simply filling a void in the literature on the history of post-colonial India, and so to formulate criticisms feels almost disingenuous. That said, I found the latter chapters—in which the interviews with former activists really come to the fore—the most engrossing, and I would have been interested to have read a little more on how the memory of Naxalbari impacts upon current practices and possibilities for left-wing movements in India. However, rather than a shortcoming, this is more an illustration of the myriad possibilities for further research that Remembering Revolution opens up. Indeed, the book is well placed to make a significant contribution to a series of wider ongoing debates in contemporary feminist scholarship: it resonates powerfully with recent writing on temporality in feminist politics by authors such as Robyn Wiegman, Elizabeth Grosz and Clare Hemmings. It also poses challenging questions for how we might theorise and understand the gendered dynamics of left movements, and also—in the context of a resurgence of work on the legacy of sixties radicalism—prompts us to consider how the memory of the New Left shapes the affective landscape of contemporary radical left politics. Thus, a lack of familiarity with the wider contours of post-colonial South Asian studies is no barrier to enjoyment of the book: Srila Roy’s analysis of the character and legacy of a fascinating historical moment has a vividness and immediacy that will undoubtedly strike a chord with all readers of Feminist Review.